I am getting the hang of the lace pattern of the glynis socks. I am not exactly watching the rows, rather just watching the stitches and knitting them so they stay in pattern. 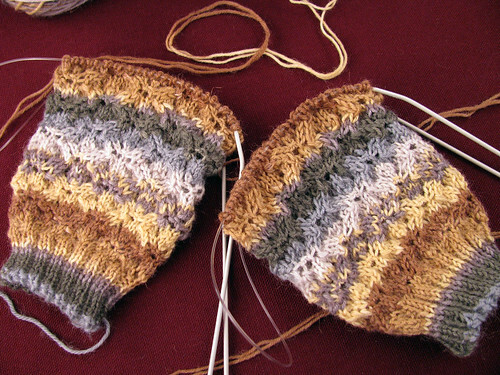 When I get to 9 repeats I’ll just split for the heel where the pattern matches the top of foot chart. Maybe this is how Cookie A’s sock patterns are knit. After reading some forum posts it looks like many of her designs require the stitches to be moved around between needles. I think I like knitting one sock on a circular needle with a loop better than using a set of double points. Matching the stripes has been a challenge. Luckily the texture of the pattern hides where I increased or decreased the tension to get the yarn to match. I won’t be able to do it on stockinette stitches on the sole of the foot though. For the last inch or so both socks have been matching without much change in tension. So the practice on the leg looks like it is paying off. This entry was posted on Thursday, April 16th, 2009 at 3:00 am and is filed under Knitting. Tagged: Knitting, Yarn. You can feed this entry. You can leave a response, or trackback from your own site.